I'm working on eliminating the plastic from my bathroom as a whole, but my travel toiletry kit presents itself with some added challenges. I exclusively use a shampoo bar to wash my hair, and once I figured it out, I love it. However every time I pack my bag to go on a trip I'm reminded with how happy I am with the decision to have a shampoo bar. To fly with the airlines there are no regulations about the size of container and what size bag it is in. Since shampoo bars aren't liquid they aren't subject to those rules so I can simply just throw the bar in the bag and go. However after the conditioner bar I moved to Plaine Products conditioner, so I have an old plastic container I fill with Plaine Products conditioner. 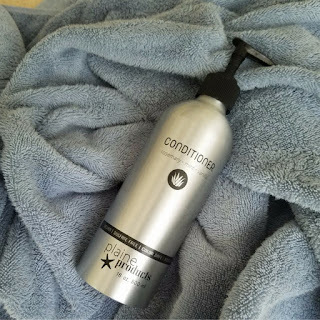 However I just found out they started selling a travel size of refillable conditioner so you want to just buy that directly (or try out the product before committing to a large size). This is another no-brainer as it is the soap I use everyday. However it is far more convenient for travel, as there is no possibility of it spilling like body wash can. With all of these bars I have to have a way of carrying them, especially if damp from the shower. Right now I am using a typical plastic bar soap container. It was one we already had and I'll have it until it breaks, which will hopefully be a long time. I say hopefully because I don't want to have to buy something and there are very few plastic free alternatives out there. I was able to find these metal tins that are large enough to hold a bar of soap so that would be an option. Another could be using a reusable food bag. Again, this is the one I use every day, I just take it with me. When I was a kid I used to have a fold up toothbrush, but again, I haven't been able to find a plastic free version. I am currently using a plastic toothbrush holder that I had. Mine covers the total brush but there are smaller plastic ones that cover the brush head. I was able to find two that are made out of bamboo, and I will be checking them out when I need to replace my current toothbrush holder Gaia Guy and Brush Naked. I also found this one that looks like it has the toothbrush and case together. I use my safety razor. I will warn you that the razor can go in a carry on, but the razor blade cannot. This makes it a little more tricky to travel with. One option is checking a bag, another option is buying blades where you are traveling too. A third option is to have a disposable razor or disposable razor head that you only use for travel, but then I guess it wouldn't be plastic free, just plastic light. Read more about safety razors. As you may remember I use oil to wash and moisturize my face. While traveling I have done a number of things: bring my oil wash, use oil from where I'm staying, use one of the bars of soap I've brought or don't just scrub my face. When you use olive oil and salt as your face wash/scrub, it's easy to find while traveling! When I have brought my own I've used a small Rubbermaid plastic container, but I like that these have locking lids. There are also silicone options. Honestly, there could be (and in the future there may be!) whole posts dedicated to plastic free or homemade make up, deodorant and hair products. 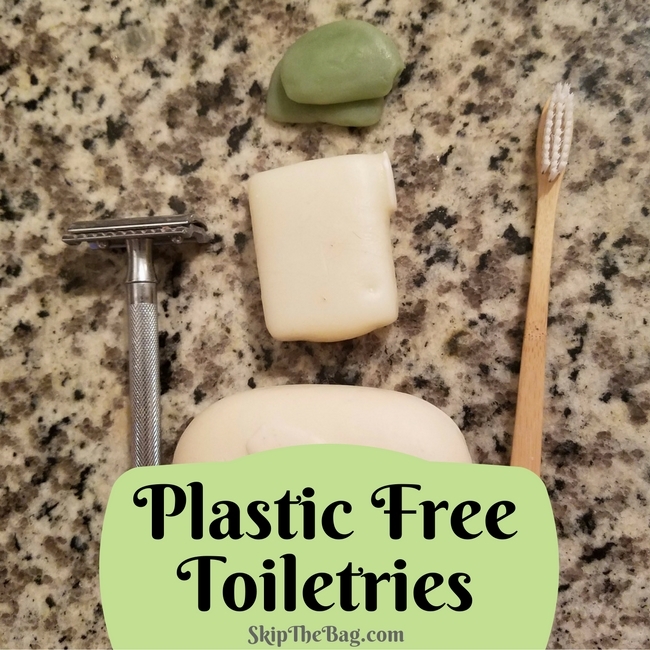 If you aren't using plastic free versions of those products at home on a regular basis, you likely won't enjoy trying to figure them out while out on vacation. So just pack up what you have and strive to have made changes by your next trip. 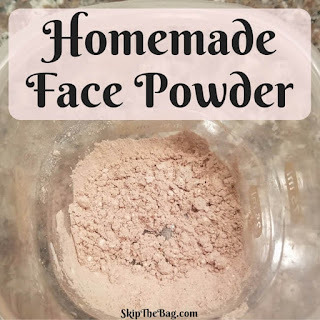 Update: I've started making my own face powder! Now this doesn't need to be anything special. It can simply be a bag that you have around the house. This one looks the most like mine which I've had for years and have given it quite the beating. Hubby's is leather and looks similar to this, but a lighter color. As you can tell I've made a lot of progress to eliminate plastic from my bathroom routine. However, there is still some progress to be made. Most of it comes from the fact that I don't see the need to discard the plastic I'm currently using. What do you have in your toiletry kit? I've recently tried to switch to shampoo bars but I just couldn't get my hair looking any good. I used them for 6 weeks and my hair still just looked as if I hadn't washed it for 3 days. What's your secret to success with them? I've got some shampoo bar tips here: http://www.skipthebag.com/2016/10/shampoo-bar-review.html I make sure I get a good lather and pay special attention to each area which shows grease (hair line, part, etc). I'd also be curious if it's just the bar you got. I've only used JR liggetts, and had good success. As far as the razor. I've also got another post: http://www.skipthebag.com/2017/02/safety-razor.html describing the different kinds. Don't be scared! Great idea to go plastic free. I have been buying all bamboo cooking utsenils and glass storage containers or reusing glass jars to store food in. I even use some special glass jars to store milk in the freezer instead of plastic containers. I don't like the idea of the plastic leaking into my food. I make my own deodorant and store in glass jar, the only soap I use on my hair is and body is Dr. Bronners . Thanks for sharing on ideas. Pinned & tweeted. Visiting from #WasteLessWednesdays! I still use store deodorant and have plastic hair brushes. When it breaks (in 30 years) I'll switch, but in the mean time it works great! It's on my calendar! Thanks! Fantastic post. I travelled waste concious n "plastic free" for first time this year and am looking forward to improving on my next vacation next week. Very helpful post, thank you. Wish me luck finding razor blades in Tenerife! !